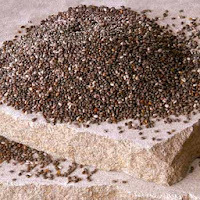 Chia seed is an ancient superfood that is currently experiencing a glorious renaissance ;) It is a member of the sage family (Salvia Hispanica). The little black and white seeds were once a staple of the Incan, Mayan and Aztec cultures, along with the Native Americans of the southwest. Like flax, chia is highly 'hydrophilic' - the seeds absorb water and create a mucilaginous gel. They can hold 9-12 times their weight in water and they absorb it very rapidly - in under 10 minutes. Chia is a very reasonably priced, concentrated food. Our 1lb bags cost $8. 1/3 cup of dry chia seeds (2 ounces) makes about 17 ounces of chia gel. This costs about $1. Depending on how much gel you use, those 17oz will likely last, on average, about four days. That is about 25cents a day. Chia can be used in so many kinds of recipes - savoury, sweet - it works with anything. You might want to try them in salad dressings, cookie mixtures, smoothies, crackers, ice creams, juices and so on. In the traditional cultures that consumed chia, like the Aztecs, chia was also regarded as a medicine. It was used in myriad ways - from cleaning the eyes to helping heal wounds, topically, to relieving joint pain and so on. It was considered extremely valuable for healing. The most common way to eat chia is to first soak the seeds. They can very rapidly absorb a large amount of liquid - between 9-12 times their volume, in under 10 minutes. As mentioned above, chia will absorb anything - it doesn't have to soak in water. We like soaking it in things like apple juice for example. That way, the intense sweetness of the apple juice is also offset by the chia and it tastes yummy ;). We also often blend fruits - for example bananas and persimmons, then stir the chia into that mixture. Again, the longer the seeds are left to soak, the more their nutrients will be readily available to you, yet you could easily eat a meal like this 10 minutes or less after preparing it. You can also sprinkle the dry seeds onto salads or add them to granola mixes. You may also want to experiment with grinding them first in a coffee grinder, to make a 'chia flour' you can then add to smoothies, soups and so on. Mix 1/3-cup chia seeds to 2 cups water. Stir. This is the 'basic gel' recipe that can be stored in your fridge and used as required. Transfer the mixture to a bowl with the walnuts and raisins and mix them in thoroughly by hand. Shape into a loaf. For major yumminess, top with ?Cream Cheese? (see below).